Home > Blog > Strategy > How Can B2B Marketers Engage More Targeted Prospects? How Can B2B Marketers Engage More Targeted Prospects? It seems that B2B marketers are still struggling to engage targeted prospects. That’s reported to be the biggest challenge in generating new leads, just as it was last year. 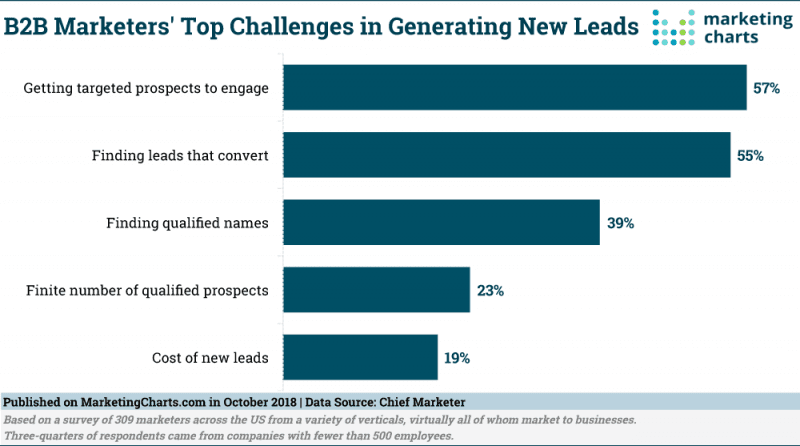 According to the 2019 B2B Marketing Outlook Survey from Chief Marketers’ website, 57 percent of marketers who responded said that when it comes to lead generation, getting responses from targeted leads proves to be the most difficult part of their jobs. The number one challenge was followed by finding leads that convert, finding qualified leads, the finite number of qualified leads, and the cost it takes to buy new leads. While these are all significant challenges for marketers, in this post I’ll focus on the struggle to engage more targeted prospects. What’s Keeping Early Stage Leads from Engaging with B2B Marketers? That question might not be quite right. Perhaps it should be, “What’s keeping marketers from engaging with qualified leads?” Because let’s be honest, it isn’t the prospect’s responsibility to engage the marketer, it’s the other way around. I think the biggest issue is that B2B marketers haven’t embraced the way that prospects want to engage these days as B2C marketers have. B2C marketers understand the importance that personalization, customer experience, and making a connection play in engaging potential customers. They have adjusted their approaches to keep up with the times, they utilize social media and personalize email marketing to connect with potential leads, and then they create memorable interactions to turn them into loyal repeat customers. Whether we’re talking about B2B or B2C, it all boils down to people selling to other people. And more and more companies are looking for the same type of experience in both. So, why aren’t B2B marketers taking a page from the B2C marketing book and doing the same? Well, there are a couple of reasons that I see. First, B2B can be much more complex than B2C. There’s much more involved than there is with a consumer purchase. Depending on your company, you may have to have numerous meetings, after doing endless research, to get buy-in from executives and stakeholders to make the purchase you’ve carefully considered. Who knows how long that’s going to take – and it’s before you even buy anything. Then there are often contracts that have to be reviewed and run past the legal department before you sign the documents. You can see how complicated it can get, even if you haven’t experienced it yourself. Another issue that B2B seems to have is their response time to potential leads. In the B2C world, you see chat options everywhere and 24-hour customer service options. People expect immediate responses – the kind they get when they have a question for an online retailer. Do you have a guess as to how long the response time is for B2B contact? It’s 42 hours. In a time when people don’t wait for more than 4 seconds for a web page to load and expect a social media response within an hour, nearly two days response time is just too long. Can B2B Marketing Challenges be Fixed? The answer to this question is an enthusiastic YES. B2B marketers can overcome the challenges they are experiencing when attempting to engage targeted prospects. I think that the biggest fix is the simplest: shorten response times to leads. There needs to be a shift in thinking from having a response time measured in hours or days to one that is measured in minutes. Whether that means adjusting job descriptions to free up time, hiring additional employees, or some other modifications, businesses will see an improvement in engagement numbers and that’s worth the expense. Another solution that B2B marketers need to consider is upping the amount of time and effort that is put into social media; it’s probably the quickest way to “touch” potential leads. You rarely see people anymore without a smartphone attached to their hands. Capitalizing on that by posting, commenting, answering questions, and otherwise interacting on social media is a quick and easy solution – if you have the manpower to do it. This is another area where adjustments may need to be made to accommodate technological changes. When B2B marketers approach customer engagement more like B2C marketers, they will see engagement skyrocket. Gone are the days that companies could take their time getting back to potential leads. Customers, whether they are individual consumers or businesses, have high expectations of the businesses they patronize. When B2B marketers meet those expectations they will encounter far fewer challenges reaching potential prospects.